George R. R. Martin may be best known for his legendary book turned TV series Game of Thrones (or A Song Of Ice And Fire for my other Westeros nerds out there) but my first introduction to his work was in the series premiere of the excellent (if dated) Outer Limits revival series in the 90's. Starring the Brigade of Bridges: Beau, Dylan, and Lloyd (Jeff was way too cool off filming Walter Hill's Wild Bill in 1995), the first episode was a heavily altered adaptation of Martin's short story The Sandkings. The simple story is one that is familiar, Beau Bridges is Dr. Simon Kress, a scientist who happens to play God with a race of micro Martians who at once deify him and then turn on him as power goes to his head. It was extremely startling for a younger version of myself, but I ate it up and wanted more. But beyond that, we rarely get to see Martin dip his toes outside of the fantasy world of the Seven Kingdoms. 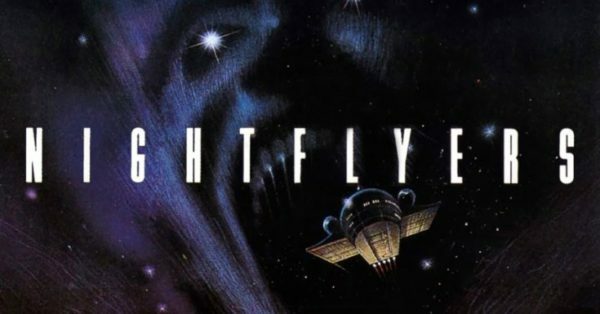 That's what makes us so excited about the news that SyFy has ordered to series: Nightflyers. Nightflyers is being billed as a supernatural thriller about a group of scientists and a talent telepath are on an expedition to search for alien life at the edge of our universe, along with the tight knit crew and reclusive captain of The Nightflyer. But when "terrifying and violent events" being to plague the ship and its crew, they learn it will take much more to survive their journey. George R.R. Martin, under contract by HBO, cannot participate creatively in the show but has a powerful team put together with Jeff Buhler (Jacobs Ladder) and Doug Liman (Edge of Tomorrow), along with a crop of some of the best writers in the business! Mike Cahill (Another Earth, I Origins) is set to direct the pilot, while Daniel Cerone (Dexter, Constantine) is tapped to be showrunner. Robert Jaffe, who wrote and directed the 1987 film adaptation of Nightflyers (pictured above) is attached to be a producer as well. Set to lead the cast is Gretchen Mol (Boardwalk Empire) alongside Eoin Macken (The Night Shift), David Ajala (Fast & Furious 6) , Sam Strike (EastEnders) Maya Eshet (Teen Wolf), Angus Sampson (Fargo), Jodie Turner-Smith (The Last Ship), and Brían F. O’Byrne (Million Dollar Baby). With that caliber of talent in front of and behind the screens, and a stellar idea by Martin, Nightflyers is bound to find an audience and maybe (JUST MAYBE) give us the limited event series adaptation of Paul W.S. Anderson's Event Horizon we never knew we wanted! From Broke To Blockbuster Rises From The Grave!